Black History Month is a time to reflect on the progress we have made and honor the leaders who helped cultivate that change. I was wondering at the start of the month how I should go about writing this piece, and I realized I should do it like the leaders illustrated on our wall did anything –– with passion. For the wall, I decided to illustrate Dr. Angela Davis, Dr. Martin Luther King Jr., Malcolm X, Audre Lorde, James Baldwin, Tommie Smith, John Carlos and Toni Morrison. These incredible leaders have paved the way for so many people and their legacy will live to withstand the test of time. 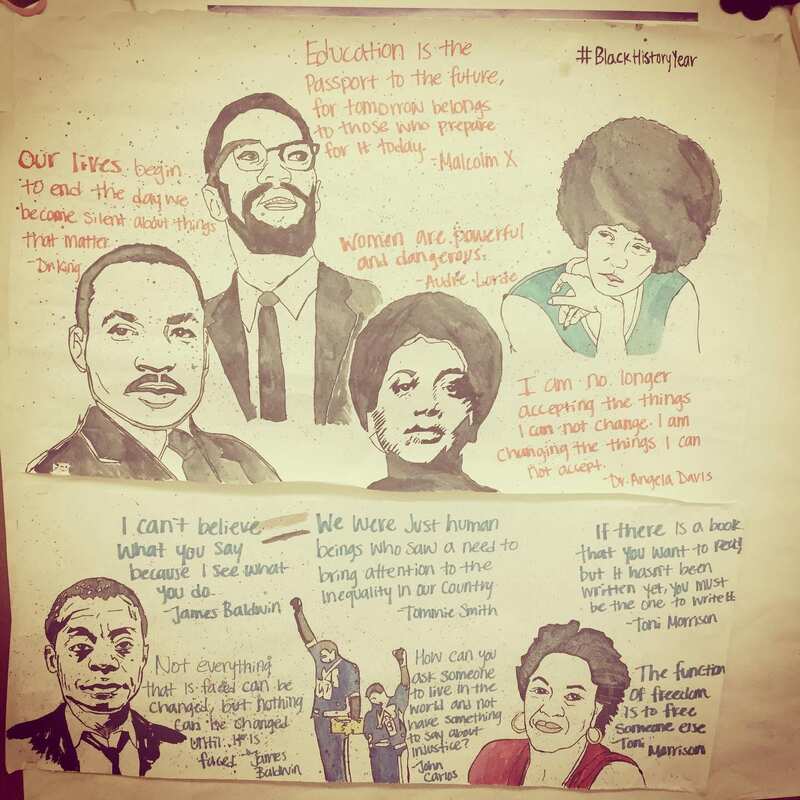 Towards the end of January, I was approached by faculty and students to see what I would do for Black History Month. I was already contemplating how I would execute the visuals for the wall and how I would manage the content online. After consulting with my team and bouncing ideas off family and friends, I thought it would be interesting to make a Mt. Rushmore styled illustration of phenomenal Black leaders. On top of creating the illustration, I also managed a weekly visuals for our media platforms by highlighting other notable Black leaders. It is imperative we look back at the people who came before us and our history. I pride myself on commemorating influential people on our wall. I do my best to represent everyone and be inclusive. We have made enormous strides but the work is far from done. From the Civil Rights Movement to #BlackLivesMatter, activists and modern day leaders are working hard to preserve the hopes and dreams of those that came before us. I urge you all to not only research the work of those highlighted in the illustration but other Black folks who have fought for change.